Mynard, J. (2014). Editorial: Understanding and supporting self-access learners. Studies in Self-Access Learning Journal, 5(2), 79-81. 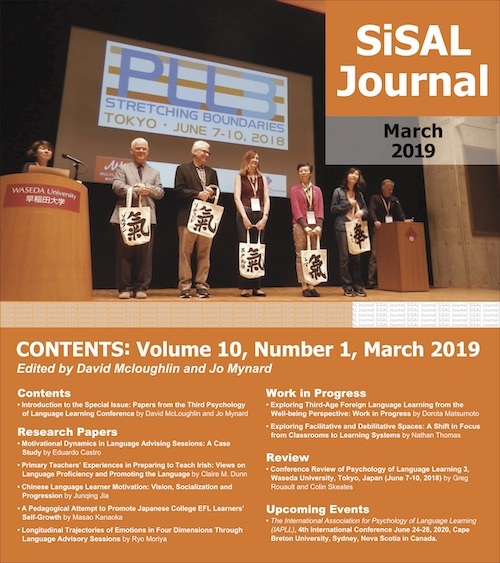 This is the 17th issue of SiSAL Journal and includes contributions from Japan, Turkey, China, and New Zealand. Although it is a general issue, the themes that bind the articles together centre around understanding our learners better and supporting their self-directed learning. The first article by Harumi Kimura shows how a SALC can encourage group autonomy. The author argues that one of the main functions of a SALC is to provide opportunities to build and maintain learning communities. Kimura uses a narrative frame and email exchanges in order to collect data from active SALC users in a women’s university in Japan and shed light on ways in which the social functions of a SALC support interdependence. The second article by Tarik Uzun emphasizes the importance of listening to the learners we serve. The author investigates learners’ needs in a SALC in Turkey and surveys both regular users and non-users. Learning more about learners’ purpose for coming to the centre and their needs will help the institution to improve the available services. Although the usefulness of learning styles has been questioned recently (e.g., Pashler, McDaniel, Rohrer, & Bjork, 2008), the importance of individual differences is certainly an area that is considered to be of great importance in self-access learning. Jing Wu reports on a project whereby learners had the opportunity to access online vocabulary learning tasks that matched their preferences. The author conducted an empirical study to establish whether vocabulary learning was more effective when tasks were matched to learners’ supposed learning styles. The results detected no significant difference in performance, but the learners benefited from being able to access self-directed vocabulary activities. Gene Thompson reports on an action research project which aimed to improve the Writing Centre service available to students at a university in Japan. The centre faced constraints and decreasing usage figures, and as a result of the research, has changed from being a limited service face-to-face peer run centre, to a more heavily accessed online writing lab. The “work in progress” piece in this issue was written by Menaka Ediriweera, Liz Howell, and Caroline White from New Zealand. The authors provide a summary of a collaborative project related to an online pronunciation tool developed for independent learning purposes. The tool is unique as it takes into account the needs of learners and teachers in the New Zealand context. The tool continues to be improved due to regular feedback from users. For the past five issues, the regular column has provided ongoing contributions from colleagues working in a self-access centre in Japan and the final installment, which is related to the evaluation of self-directed learning, is by Junko Noguchi. The column editor, Katherine Thornton introduces the piece and the story is concluded with a brief article by Elizabeth Lammons. A new column from the UK context will begin in the next issue of SiSAL Journal. We conclude this issue with a report I wrote based on research conducted with Tim Murphey into evaluating SiSAL Journal. Many readers participated in the research and may be interested in the results. The measures used to evaluate SiSAL Journal were based on the principles of diversity, accessibility and quality. The results identified some successful factors that we can celebrate, and also highlighted some points that need attention over the coming years. We are grateful to everyone who participated in the research. Jo Mynard is the founding editor of SiSAL Journal. She holds an M.Phil. in Applied Linguistics from Trinity College, Dublin (Ireland) and a Doctorate in TEFL from the University of Exeter (UK). Her research interests are in self-access, affect, advising, learner autonomy and CALL. I am grateful to authors, reviewers and members of the editorial team who helped to produce this issue.